Hardcover, 130 pp., 3 illus. When the American Revolutionary War ended in 1783, there was no central mint to supply the newly independent states with coinage. In fact, nearly a decade passed before Congress formed the US Mint in 1792 and attempted to unify the growing nation’s coin types. In the meantime, some of the states produced their own coins, under what were often primitive and difficult circumstances. Mute witnesses to our nation’s beginnings, these coinages have not always received the proper study they deserve. 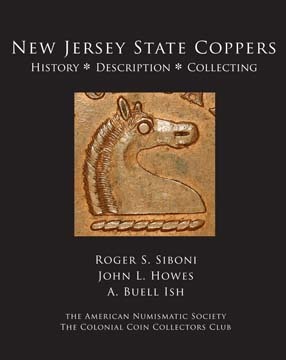 A case in point are the copper coins minted by the State of New Jersey, some of the more interesting state coinages because of their design and the circumstances under which they were made. 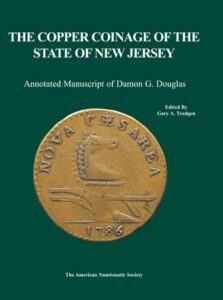 Decades ago, Damon G. Douglas began an extensive research project on the history of the New Jersey state coins. This important project was never completed, but Douglas’ unfinished manuscript was acquired by the American Numismatic Society where it has been one of the more frequently consulted items on early state coinages in the library collection. In the interest of making Douglas’ work more widely available, the American Numismatic Society publishes this valuable study for the first time. 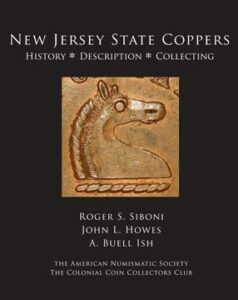 In addition, the manuscript has been annotated by prominent specialists on New Jersey coppers – David D. Gladfelter, Roger A. Moore, Md, FAAP, Gary A. Trudgen, Dennis P. Wierzba, Raymond J. Williams – in order to bring the work up to date.